All volunteer organization dedicated to helping residents of the Greater Willow Creek Area protect their lives, homes and community from wildfire. We currently have 2 free services available to members of our community in the greater Willow Creek area. Fundraising for our activities is through fundraising events, membership dues and donations from businesses and residents. The Willow Creek Fire Safe Council offers a free chipping service to individuals in the greater Willow Creek area to assist with reduction of fire fuel and with creating a defensible space around your residence. Program open to Seniors (65 or older) and Disabled. Willow Creek Fire Safe Council has teamed up with Dream Quest’s “Agents of Change” youth group. Youths participating in the “Agents of Change” program will come and remove brush and create a fire defensible space around residential properties in the area. WCFSC will come and chip it at a later date. If you are 65 or older or disabled, contact: PJ Shannon at (530) 629-3564. 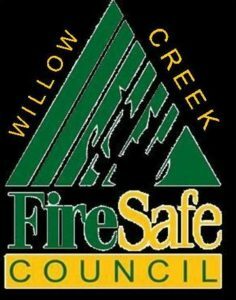 Willow Creek Fire Safe Council Board Meeting is scheduled on the first Thursday of the month at 7 pm at the Willow Creek Community Services District Office. Public are welcome. Willow Creek Fire Safe Council is an IRS 501(c)(3) non-profit organization run entirely by volunteers.